... but then I forgot to make the card! I have begun using the retired but much-loved Top Note die to make the inside of my cards a little more special than they have been in the past. I hope you enjoyed my card today! Won't you please take a few seconds to leave me a comment? They make my day. 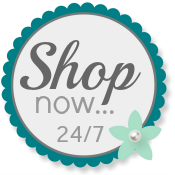 Please use my Online Store any time you wish to purchase Stampin' Up's quality products.